In fire fighting, the quick, unhindered access to the scene of the fire is important for the fire brigade. In addition, the object also needs to be protected against intrusion by unauthorised persons. The Fire Brigade Key Box FSK700-2 serves for the theft-save and copy-pro-tected safekeeping of a building key. In the event of a fire, the control logic unblocks the door of the depot and allows the fire brigade quick and nonviolent access to the building. The housing and the outer door of the key box are completely made of stainless steel. An electric drilling protection and inner doors made of 5mm stainless steel ensure high security. The withdrawal of the building key is monitored by a micro switch. 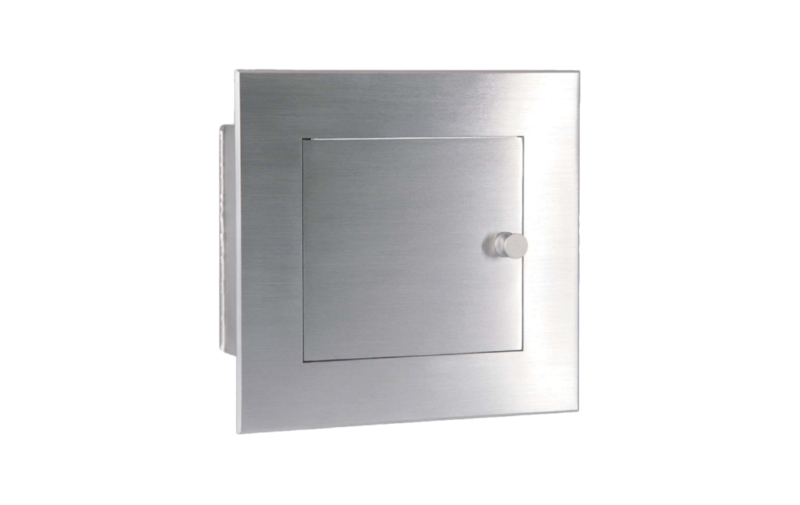 If the key is not deposi-ted properly afterwards, a buzzer sounds.The outer door and the blind frame that is fixed to the safe are made of ground stainless steel and represent a stylish visible area. The special design of the interior ensures great ease of use. The wide range of accessories, such as the Flush Mounting Frame EZ700-2 for easy installation, inner doors for the different locks, the protective cover as well as the power supply for the heating of the outer door allow to completely adapt the product to the particular applicati-on. The electrical connection is established comfortably by means of screw terminals.The Fire Brigade Key Box FSK700-2 has been tested according to VdS 2105.